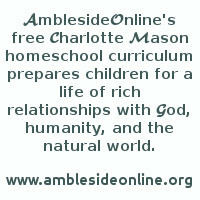 Charlotte Mason included in her Original Homeschool Series books some lists of attainments, goals or objectives to be met by certain ages. She has one for 6-year-olds and one for 12-year-olds. "A Formidable List of Attainments for a Child of Six", a reprint of a curriculum outline from a CM school in the 1890's. What a Child Should Know at Twelve, from the appendix at the back of School Education, Volume 3 of her series. (a) To grasp the sense of a passage of some length at a single reading: and to narrate the substance of what they have read or heard. (b) To spell, and express themselves in writing with ease and fair correctness. (c) To give an orderly and detailed account of any subject they have studied. (d) To describe in writing what they have seen, or heard from the newspapers. (e) They should have a familiar acquaintance with the common objects of the country, with power to reproduce some of these in brushwork. (f) Should have skill in various handicrafts, as cardboard Sloyd, basket-making, clay-modelling, etc. (g) In Arithmetic, they should have some knowledge of vulgar and decimal fractions, percentage, household accounts, etc. (h) Should have a knowledge of Elementary Algebra, and should have done practical exercises in Geometry. (j) They should have some power of understanding spoken French, and be able to speak a little; and to read an easy French book without a dictionary. (k) In German, much the same as in French, but less progress. (l) In History, they will have gone through a rather detailed study of English, French, and Classical (Plutarch) History. (m) In Geography they will have studied in detail the map of the world, and have been at one time able to fill in the landscape, industries, etc., from their studies, of each division of the map. (n) They will have learned the elements of Physical Geography, Botany, Human Physiology, and Natural History, and will have read interesting books on some of these subjects. (o) They should have some knowledge of English Grammar. (p) They should have a considerable knowledge of Scripture History and the Bible text. (q) They should have learned a good deal of Scripture and of Poetry, and should have read some Literature. (r) They should have learned to sing on the Tonic Sol-fa method, and should know a number of English, French, and German Songs. (s) They should have learned Swedish Drill and various drills and calisthenic exercises. (t) In Drawing they should be able to represent common objects of the house and field with brush or charcoal; should be able to give rudimentary expression to ideas; and should be acquainted with the works of some artists through reproductions. (u) In Music their knowledge of theory and their ear-training should keep pace with their powers of execution.